Why Do People Go Rushing Headlong To Shake Shack When Eisenberg’s Sandwich Shop Is Right Across The Street? As you probably know by now, I remain convinced that the most overrated burger in New York City can be found at Shake Shack. To this day I do not understand why it generates such massive lines and a cult-like following. I mean Shake Shack loyalists have this near-fanaticism which prompts them to full-throatedly yell “THIS IS THE BEST BURGER” like Donald Sutherland at the end of “Invasion of the Body Snatchers” while stumbling, staggering forward in slow-moving lines, drooling like zombies that smell fresh brains. Now I will eat at Shake Shack. And I think they serve, well, a burger. But is it better than Five Guys? Nope. 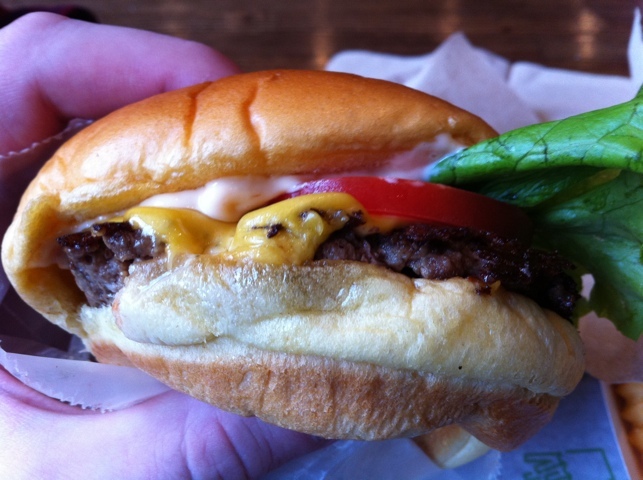 Is it better than any one of a myriad of better burgers I could point you to? No. My buddy Sam asserts that “It’s the whole experience” of getting a concrete and lounging outside while eating a burger that’s part of the Shake Shack shtick. Well my experience involves too many strollers, waiting on lengthy lines, and not necessarily even a cheap price once factoring in your drink and fries. The burger’s good, but I don’t think it is good enough to justify all the ruckus. Much like Good Enough To Eat. Nowhere is this more true than at the original Shake Shack site in Madison Park, which is perhaps the best expression of Shake Shack in town. There is a picturesque park, you can eat outside beneath sun-dappled trees, and generally have a very pleasant time. However the lines there are so notorious that Shake Shack themselves took it upon themselves, as a customer service, to provide a live-streaming “line cam” so you can see how many circles of hell you have to get through to get their burger. On balance, I do not get it. If there’s no line and I felt like a burger, sure. But if there is a long line, nope. Especially when New York City institution Eisenberg’s Sandwich Shop is a block away. The shop is proud of its rich history. Eisenberg’s tagline is “Raising New York’s Cholesterol Since 1929.” No I did not make that up. It is printed on the front of their menu. Eisenberg’s is a throwback. It is a long, thin railroad-car of a shop, with a counter, many stools, and a small eating area in the narrow back. It is the kind of place where you are likely to get nudged a little as people walk past. Additionally, hanging coats and other ephemera may make their presence known, depending on where you sit. In short, it is not a place that is big on comfort. It is, however, big on comfort food. 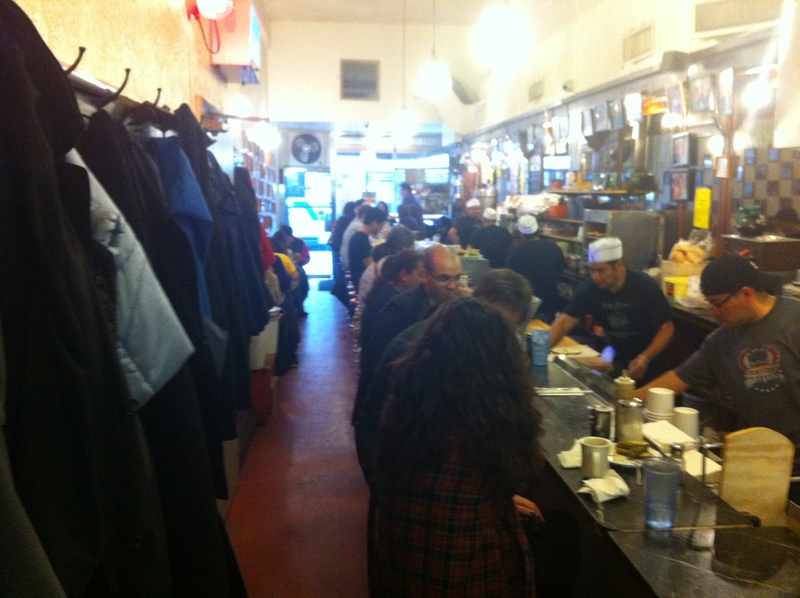 The narrow shop, with protruding coats, and stools, and waiters, and patrons... .
Eisenberg is perhaps best known for its tuna fish sandwich, although I suppose that’s debatable. Either way, they have a reputation for it, and some argue it’s the best tuna in the city. Of course, I believe the best tuna in the city can be found at the sensational Murray’s Sturgeon Shop on the Upper West Side, but that’s another story. In short, I feel no obligation to eat the tuna when I go to Eisenberg’s. 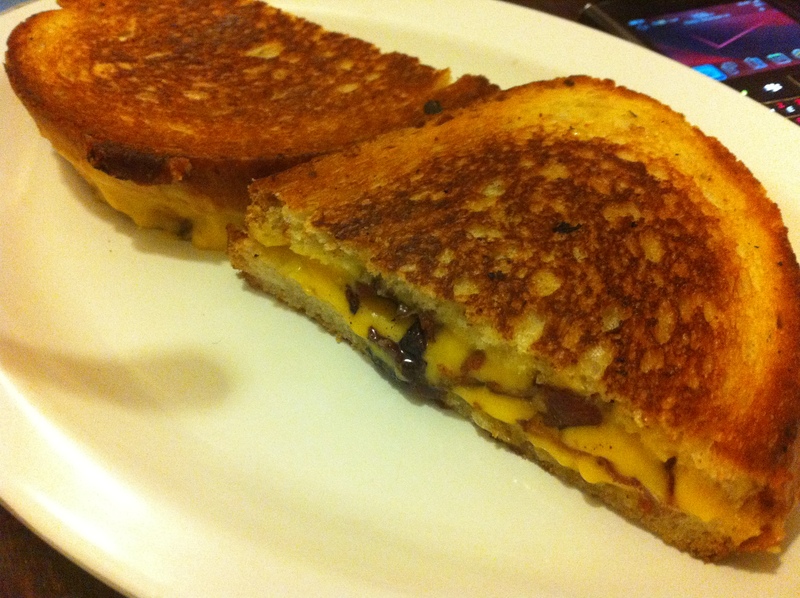 On this occasion, in fact, I was just in the mood for a grilled cheese and bacon on rye. But first, an Egg Cream, and some matzoh ball soup. The egg cream is proper. 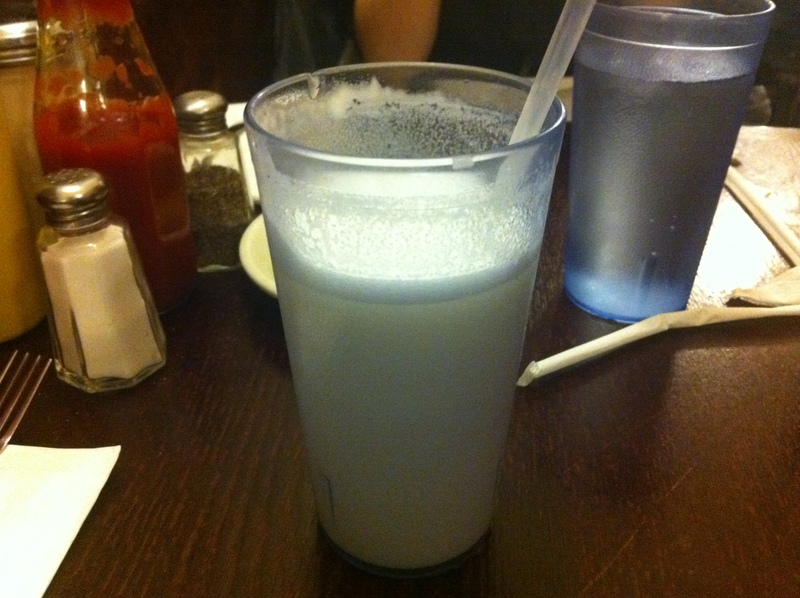 It has become almost impossible to find a decent egg cream – formerly ubiquitous – in town. They are usually too sweet, mishandled, put together by people who don’t get what it’s supposed to be. While tops for egg creams remains perhaps at Gem Spa, there’s no doubt that Eisenberg’s gives them a solid run for their money. The Eisenberg’s egg cream is sweet without being too much so, milky without being overly so, and fizzy. It’s delightful. Also let us take a moment to reflect on their matzoh ball soup, and Community Restaurant, I want you to pay special attention. At Eisenberg’s, which does not shy away from being a greasy spoon-type joint, you are served your portion in a cheap plastic bowl with a dingy tin-feeling spoon. The broth is a bit too salty, though there’s plenty of carrots and celery. It seems a bit greasy, but not unforgiveably so. The broth is far and away better at Community, easily. However, the Eisenberg’s matzoh ball is terrific. 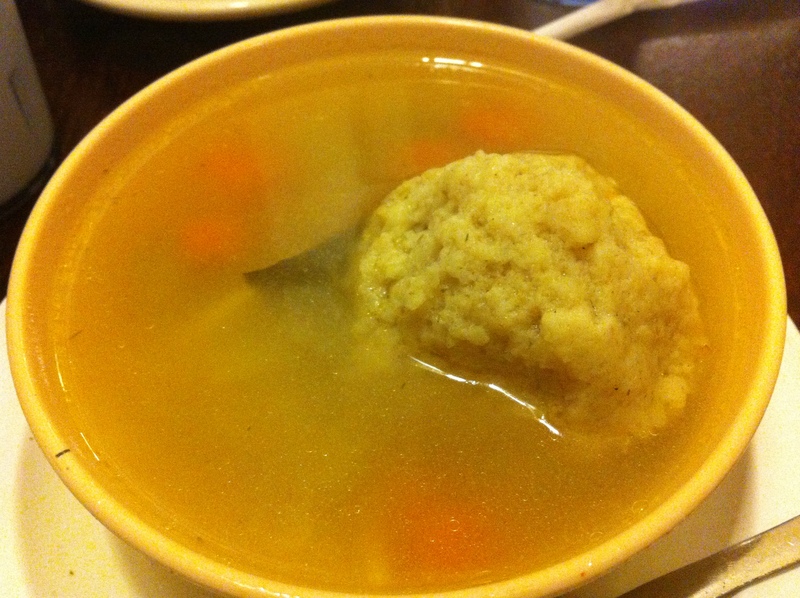 There are two types of matzoh balls: sinkers and floaters. Both are delicious, but my heart belongs to floaters. Eisenberg’s delivered in style. Light and fluffy, like a dumpling. Marvelous. They don't keep kosher... .
What you see before you above is the simple, delicious excellence of an expertly handled grilled cheese and bacon. Now this not some gourmet, artisanal bacon, or fancy shmancy cheese. Nope. Simple rye bread, bacon, and American. Eisenberg’s lives up to its credo, in this case spiking my cholesterol, I am sure. Two sandwiches, the soup, and two egg creams clocked in at $25. 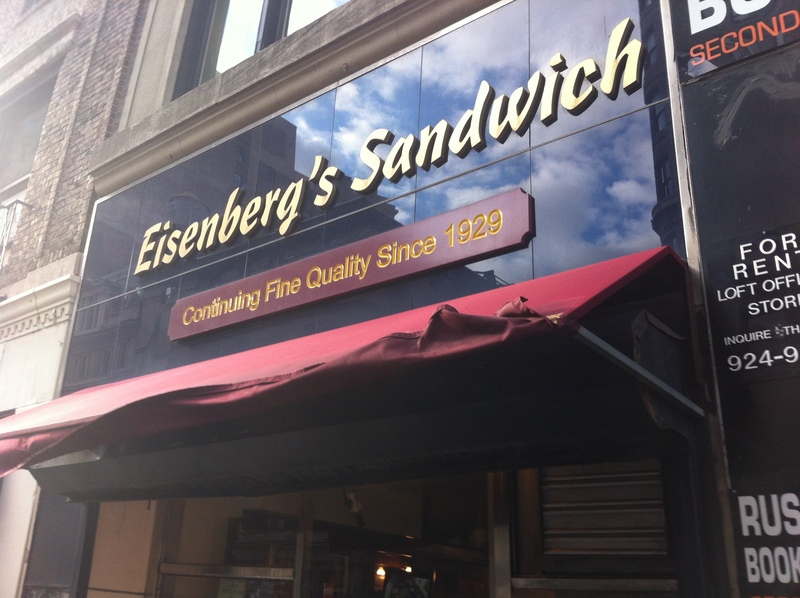 Again, I am not arguing that Eisenberg’s will make some haute sandwich that will dazzle. No. They will make a basic, decent sandwich, in an old-school atmosphere with classics like “Take The A Train” playing over the speakers. It’s a great old-school place and a very reliable spot in that neighborhood.